LAMP (Linux, Apache, Mysql & PHP ) is an open source web development platform that uses Linux as the operating system, Apache as the Web server, MySQL as the relational database management system and PHP as the object-oriented scripting language. It is powerful and also comparatively simple and easy to use. This article will help you configure LAMP in Centos7. Before you begin LAMP INSTALLATION , you should have a server with root user privilege. By completing steps mentioned below you can configure LAMP in your server. 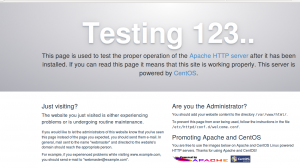 We can install Apache easily using CentOS’s package manager, yum. Now your mysql database is running.You can access database without any password its not secure so we need to provide password protection. You set a mysql root password for your database server so from now on you can’t access it without password. “root” session do not know password to mysql root user. where of-course “mysqlrootpassword” is your password for mysql’s root user so when you execute mysql command it uses this password. 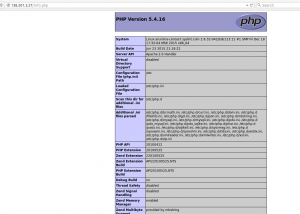 After installing PHP, you should restart apache. We will call this script info.php. In order for Apache to find the file and serve it correctly, it must be saved to a very specific directory, which is called the “web root” or “document root”. Now we can test whether our web server can correctly display content generated by a PHP script.